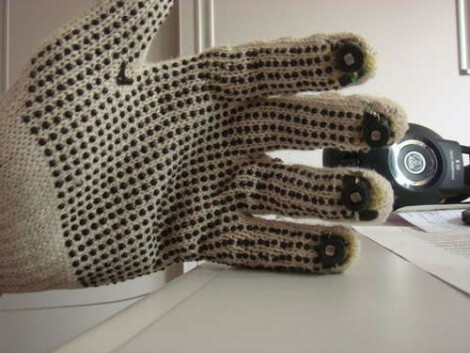 The latest offering in glove-based noisemakers forsakes commonly used flex sensors in favor or photoresistors. [Bruno Ratnieks] is responsible for this musical glove and his methods will be very easy to recreate. He used an Arduino to interface with it while providing a USB connection to your audio software. The sensors themselves couldn’t be easier to throw together, with each photoresistor creating a voltage divider when combined with a fixed-value resistor. That’s all the hardware you need, and with some creative coding you can making it do much more than the effects heard in the video after the break. Some will say that [Bruno] simply didn’t used enough duct tape with his project design. Be we liked how he wove the wiring into the mesh of these knit gloves to keep it firmly in place. I really like the setup though, that’s awesome.